What Does a Nephrology Nurse Do? Treating patients with kidney impairments requires specialized medical care, so understanding what a nephrology nurse does is important for patients and healthcare providers alike. Neprhology has been a medical specialty in nursing for more than 35 years, focusing on kidney function and associated pathologies, treatments and care, according to the American Nephrology Nurses’ Association. The field has grown to reflect the advancement of medical technologies and patient care standards which in turn have determined the need for more specialized nursing care for nephrology patients. 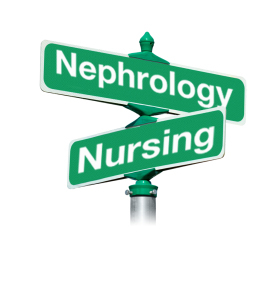 As a result, nephrology nurses must meet the traditional standards of patient care, while also performing many specialized tasks that require additional training and certification. Educating patients about kidney disease, its effects on daily life and preventative care. Providing management techniques to patients for controlling kidney ailments at home. Informing patients about diet and exercise plans that benefit kidney function. Addressing the emotional impacts of kidney disease that affect normal daily activities and relationships. Understanding drug protocols for kidney treatments and administering them correctly. Administering or supervising various dialysis treatments. Working on surgical teams for kidney transplants or organ donations. Teaching and supervising other nephrology healthcare providers. Qualified nephrology nurses are accredited to work in a variety of inpatient and outpatient settings and in programs that are dedicated to sub-specialties within the field. They find employment in all hospital departments, dialysis clinics, home-care and rehabilitative settings, assisted living and nursing homes, transplant units, surgical centers, or critical care facilities. Their jobs reflect the diversity of specialization that is found within a nephrology nursing career. Nephrology nurses hold either an associate’s degree or bachelor’s degree in nursing and have passed the National Council Licensure Examination to become registered nurses. According to Discover Nursing, they then work a minimum of two years as an RN while completing at least 2000 hours of on-the-job nephrology care through continuing education programs. Finally, candidates must pass the Nephrology Nurse Certification Exam sponsored by the Nephrology Nurse Certification Commission to become full-fledged nephrology nurses. As noted by the National Kidney Foundation, the number of patients with chronic kidney disease continues to rise each year. This is due in part to an aging population with more medical needs, as well as to the technology that helps sustain patients of all ages with kidney ailments. These circumstances have increased the need for qualified nurses with nephrology training and certification nationwide. In response, more medical facilities now provide information to its patients about what a nephrology nurse does and train aspiring nephrology nurses to become excellent caregivers for those with kidney impairments.